Born in eastern Zambia, blind, he rose to become junior Minister of Culture, and arguably the country’s most popular folk singer. 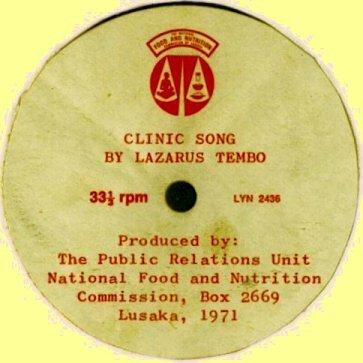 A Zambian folk music award was named after him. He also supported the work of the Lusaka Nutrition Group, an organisation which was a precursor to the work of Makeni Centre, before 1971. He once sang at Carols By Candlelight, a fund-raising event for the LNG (before 1971) and later for MEC. The educational recording below was distributed as a single on plastic (the original floppy disk!) with the Dzithandizeni (“good health”) symbol in red on a white label, for the National Food and Nutrition Commission of Zambia. The lyrics talk about how to feed your baby well. Here’s another one I’ve uncovered, one side of which is a version of Ulwimbo Lwkaulisho Mwana in another local language. The other side is another charming little song about taking your baby to the clinic. Edwin Nyirenda has kindly provided us with a translation of these Nyanja songs! When my baby sits on the scale, Sister can tell whether it’s growing strong.